We’ve added some photos to our collection! First is a set of photos taken at the “National Icons, Local Treasures” benefit concert held on April 27, 2016. Next we have two wonderful photos of Carl Sandburg appearing at Central in 1953. The month of April is packed with activities for the Sandburg Festival. Of note for Central Church is the concert on Wednesday, April 27. Proceeds from the evening will equally benefit the Carl Sandburg State Historic Site Endowment and the Central Church Historic Building Preservation Fund. For more details, check out the following sites. Click this link to go to the Sandburg Festival site event page. Scroll until you get to April 26. (The date of the event is actually WEDNESDAY, APRIL 27!). There are lots of great details of the event and presenters. We hope to see you there! Click this link to go to the Galesburg Register-Mail story that ran April 25 which gives a brief description of the remaining events. Please bring your friends and join us for an evening of great music! A bit late but here is the November 2015 edition of our monthly newsletter, The Crier. Click the link below to open a PDF version. Features reporter Fran Riley and photographer Randy Biery from KWQC TV Channel 6 were back for another taping at Central. This time the topics were the organ, the Director of Music/Organist for the congregation, and a very special upcoming event. Click here to view the segment. Lots of activity going on at Central Church! 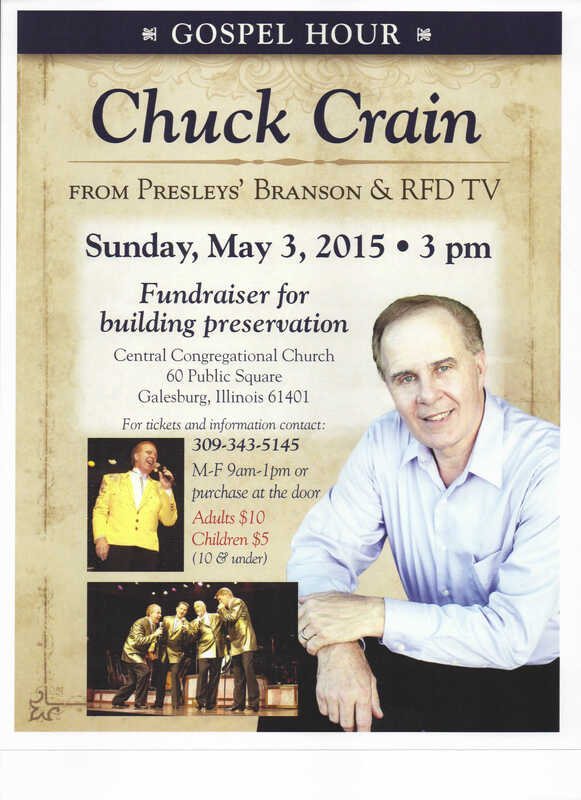 Next up is this wonderful concert by Chuck Crain. The folks who have heard him here before are really happy that he will be back in Galesburg for this return engagement. Please join us and see what the excitement is all about. 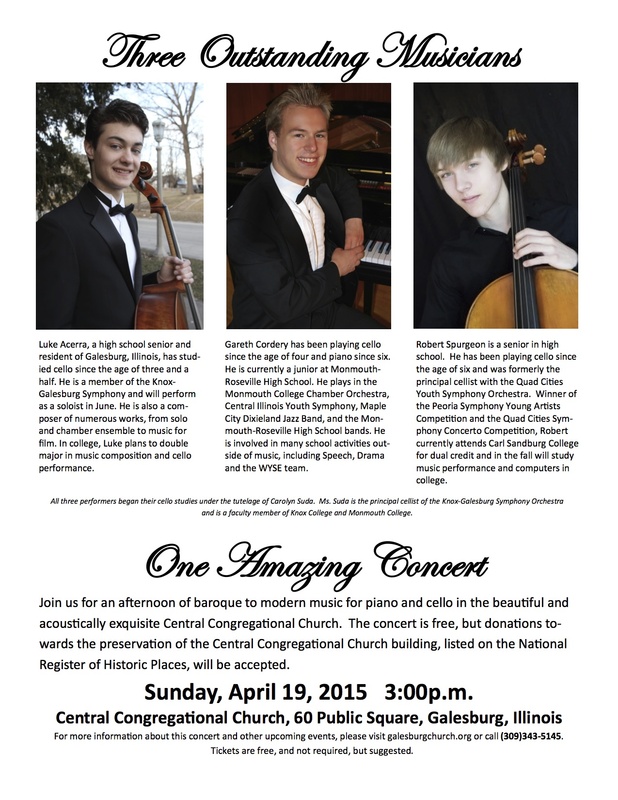 This concert is a fund raiser towards the preservation of the Central Church building. Tickets are available at the door.